The National Healthcare Service(NHS) will continue to fund homeopathy. The Commons Science and Technology Committee claimed that trials in homeopathy show that they are no better than a placebo. They claim that the NHS is funding tax payer money for a sugar pill. The British Medical Association backed the committees report. They say all homeopathy referrals should be removed from the NHS. Homeopathy medicines should not be sold as medicine on pharmacy shelves. The BMA voted on the issue of homeopathy at their last conference. Most doctors voted against in favor of supporting homeopathy. However, some doctors thought homeopathy was a good alternative for some patients. They said many medicines used today are unproven. It would be unfair to prescribe unproven medicines and not prescribe homeopathic medicines. The UK Health minister has said patients should have the choice to choose the treatment that they feel is appropriate for them. Homeopathy does not pose a risk to patients. This system of medicine has been on the NHS since 1948. There are four homeopathic hospitals in the United Kingdom. Patient satisfaction is quite high with this form of treatment. UK spends about 4 million pounds a year on homeopathy. This is an extremely small amount of money in the NHS budget. The NHS budget is more than a 100 billion pounds. Homeopathy is not as popular in the US as it is through out Europe. However, it is still a 2 billion dollar industry. Single remedies are definitely hard to find in the US. Combinations medicines are much easier to find. In this blog entry, we are looking to see where we can find homeopathic remedies. The picture above shows the popular store fronts that I went to in search of homeopathic medicines. These are national stores. Most of them can be found through out the country. I went into the GNC inside the mall. This is a mini GNC. Larger stores may have more selection of homeopathic products. I did not find any single remedy products. I found a bunch of Hylands combination remedies such as Nerve Tonic, Leg Cramps, Calms Forte and Arnica ointment. I also found BHI traumeel and Bach rescue remedies. The most surprising discovery was GNC had their own manufactured homeopathy products. They had their own GNC homeopathic nerve tonic as well as their own Arnica. The next store I went to was Vitamin Shoppe. I was expecting to find quite a bit of homeopathy here since it a health food store. I was disappointed with the single remedy selection. They had many of the most common single remedies in a 6x, 6c, 30x, 30c potency. They also had all the homeopathy cell salts in a 6X. There were no other potencies. The single remedies were only in a small size. I was really astonished how much homeopathic combination medicines were available. They had pretty much every combination product from Hylands, Boiron, Nelsons, Similiasian, king bio and natur bio. They also had some brands that I was not familiar such as Dent tox, and Vaxa. The next store was cvs pharmacy. No single remedies to be found here. I did not find any homeopathy products other than cold remedies. These included Boiron products such as oscillococcinum, cold calm, sinusalia and Zicam cold products such as cold remedy and sinus relief. I was also shocked to see CVS making their own version of oscillococcinum. The final store was Walmart. No single remedies but quite a few homeopathic combinations remedies were found. Hylands had the most combination products. I found teething, calms forte, ear drops, nerve tonic, restless legs, children cough syrup. Other brands included Similisian eye drops and ear drops, Zicam allergy, Zicam cold relief and Zicam congestion and Boiron oscillococcinum. Walmart had homeopathic remedies pretty much scattered through the store. The other stores that I visited had a section for homeopathy or the remedies were in one area. In conclusion, homeopathy combinations seem to be available through many US store fronts. Some stores offer large selections than others. Single remedies are hard to find in the US. They are not as readily available as the combination products. Homeopathy which was invented in Germany by physician Samuel Hannaheman. He came up with the idea because he was fed up with the medicine that he would have to give to patients. Often times, the medicines given to patients would do more harm than good. He came up with this idea of like cure like. The medicines would have no side effects and be diluted so that it would not harm the person. This type of alternative medicine has flourished all over the world. Homeopaths can be found through out all of Europe. Homeopathy is very popular in German. Half of state insurers in Germany cover treatments. Germany is also facing a health care crisis. Germany will not be able to cover their health care costs. They are looking to cut anything that they deem not to work. Karl Lauterbach, the centre-left Social Democrats’ chair on the Bundestag health committee, has said insurers should not use public money to pay for homeopathic treatments. The director of federal joint committee for doctors and insurers, Rainer Hess, stated that Germany should not pay for unproven medical treatments such as homeopathy. However, politicians in Germany have prevented any legislation from passing to prevent treatments for now. The leader of the German medicines assessment body, Jürgen Windeler, says proof in homeopathy is well documented. No more proof is required to deem this treatment as effective. The cost is also very minimal. Removing homeopathy from the German health care system will not solve the health care crisis for Germany. Medicines are very cheap and cost effective. Pharmacetical drugs are 10 times the cost. 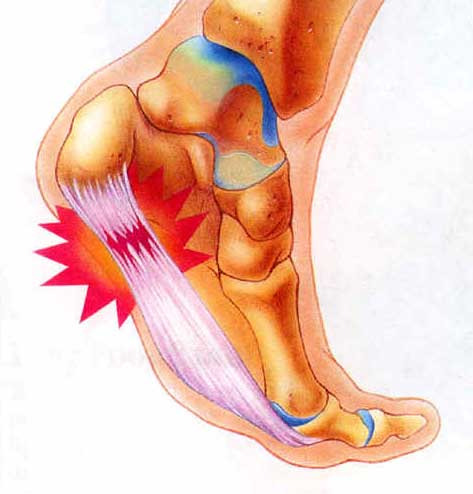 Plantar Fasciitis is an inflammation of the plantar fascia. A picture of the plantar fascia is below. The red area shows the inflamed fascia. This can lead to serious foot pain. There are various treatments that help with plantar fascitis. Homeopathic treatment can offer pain relief form an inflamed plantar fascia. Some popular homeopathic remedies for plantar fasciitis are hypericum perforatum. This remedy helps relieve inflammation in the foot. Hypericum is commonly know as Saint John's wort. The remedy should be taken orally in a 6X potency. It should be taken 3 times a day with a dosage of 3 to 4 pills. Thuja Occidentalis is another popular medicine for plantar fasciitis. This remedy is used to reduce aching feet and heel pain. This helps feet that are tired and sore. This remedy is usually rubbed into the feet via an ointment. Other remedies that are used for foot pain are Nux Vomica, Rhus Tox, Ruta Graveleons and Arnica Montana. An ointment containing Rhus Tox, Ruta Graveleons and Arnica Montana can be found. This can be rubbed into the feet as well. Homeopathic ointments can be found in either a lanonline and petroleum base as well as an olive oil base. The olive oil base is more expensive. However, olive oil is know to have some pain relief qualities. Some people do opt to use the olive oil oinment due to its healing properties. Some other non homeopathic treatments to help with plantar fasciitis are foot massages. You can do this yourself or go to a massage therapist. Ice baths for aching feets help relieve inflammation. Orthodontics also help with foot support to get rid of the plantar fasciitis. Stretching your calves, help ease the foot pain. Stretching offers more elastic to the fascia which will leads to reduce pain. Resting the feet by not running or walking help ease the inflammation. Go swimming to get your cardio exercise, if you have aching feet. Once your feet starts feeling better slowly resume your normal walking and running activities. Start with 25% of your normal activity to start. Slowly start increasing this activity. Stop the activity if the feet start to hurt again. Homeopathic remedies can offer some relieve of an inflamed fascia without having the side effects of conventional medicines. A combination of homeopathic pills and ointments offer a great way to relief plantar fasciitis.